Wireless Headsets and Headset Batteries - Headsets Direct, Inc. When you are deciding on a wireless headset for yourself or your company this is something you may want to consider – the headset battery replacement options. Let’s say you’ve found the wireless headset that you know your company will like; from the sleek, low profile wearing style to the incredible microphone and speakers…and best of all, it’s in your price range. You’ll want to factor in what sort of battery life you can expect with that headset, and what is the best fit for your company. If you pick the Savi W730, for example, it will give you great sound and comfortable wearing though your entire day. You get 6 hrs of talk time from it, and charging it at lunch ensures no gaps in your talk time; however…the headset battery inside is not replaceable. You’ll get 5 or 6 years of fantastic service from the headset. You won’t need to be worried about battery life until the 5 year mark approaches. You’ll just need to plan that when that battery dies you’d need to replace either it with a spare W730 headset or get a new wireless system. If you like the Savi W8210 or W8220 headset, it’s a different story. You can replace those batteries and depending on usage, it may be 2-3 years before replacements are needed; you wouldn’t have to replace the headset itself. The W8210 and W8220 will give you 13 hrs of talk time, so if someone forgets to charge it at lunch, it can still carry them through their busy day. 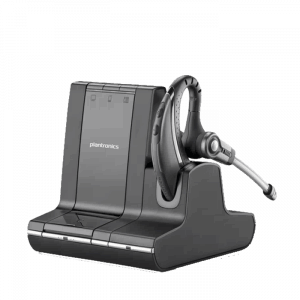 In addition, if you are purchasing for a company with many employee’s, having a headset where you can replace a battery every few years, and still get a lot of life from the headset may be the right choice. If you keep a few batteries on hand you’ll be able to make a quick change and have that employee back in business in minutes. However, getting 5-6 years of excellent service from your headset with a non-replaceable battery may be perfect if you love the style and function you’re getting from it and you don’t wish to deal with replacing batteries. Above all give us a call if you are unsure and we’ll be happy to go over all your options with you.